Follow inspiring projects as they develop then show them off ! This is my latest project. By latest I mean in the last decade. I got this car about 9 years ago and thought it would be a fairly quick restoration. Its the fourth MM I've done in whole or parts. But time has taken its usual course and it's only this summer that I am able to set aside some time to really crack on with it. I knew it was a wreck when I got it (cheap) and it had already been the subject of a partial restoration ( not good). I did not mind it being so bad as it made my conscience easier about chopping the roof. In any case knowing that I needed to replace the floor pan and much else gave me confidence that it would finally be solid enough not to fold up when chopped. Its turned out worse than I thought but I am nearly there. I have never come across one with so much rust between the underneath of the gutters and the main window/roof frame - how does enough water stay there to do that? 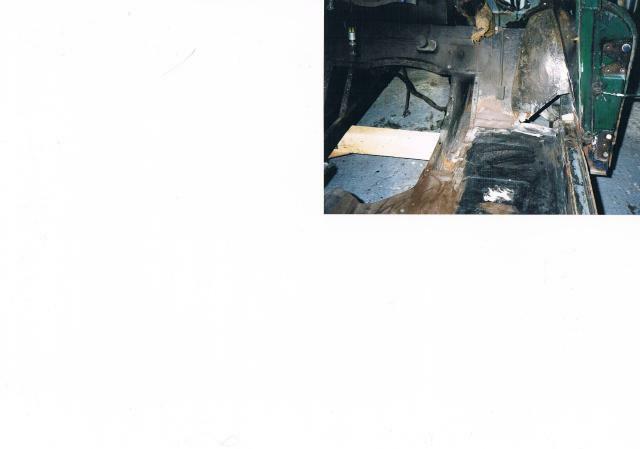 The whole car had also filled up with water from time to time and rotted through the floor. Anyway I am nearly there - at least with the welding. Quite a lot of patches and whole new rear sills are now in as well as the main floor pans, floor sides, suspension points and the required strengthening panels to allow the roof to be removed. By the end of the summer I hope to have it painted up. Yes it is. I thought it would not do any harm to have a bit more stiffening at the front. I put them in before I started to rebuild the A posts to make sure that none of it moved when I cut most of the A post out especially at the bottom. Well, its seven years or so since I last posted. All my plans to complete the car in 2011 came to nothing. One job change and a house move later I managed to set to work again and the car is now actually finished and on the road. I am going to put up some posts to fill in the story. I hope you all like the result. The first challenge was to get enough of the car together to put it on a trailer for the house move. So I finished the engine rebuilt and put some paint on all the new metal. The roof was cut off - and nothing folded up! All the door gaps remained solid. I chose to cut the roof in line with the quarter lights because there willnot be a convertible roof just a tonneau cover when I can get around to it. Here are some more pictures of the strengthening bits welded in to keep the body as rigid as possible. On the road there seems to be hardly any movement at all except in the front windscreen frame which vibrates against the quarter lights at low revs. I don't think that there is much more I can do about that. I thought I might have prevented that by welding a strip of angled steel in the gap between the inside of the water/drip strip along the roof line and the panel join where the draught excluder goes. It does mean that the draught excluder has to go over three thicknesses of metal but that worked out OK using the push on all black version without the clips. New floor panels and sills. All pretty standard stuff. Front end views of the car. This was just prior to stripping off all the old paint. You can see from the pic below that I painted the engine bay in what we decided would be the new colour - Trafalgar Blue. The paint was a brush on synthetic enamel which is used for commercial vehicles. it does not give as smooth a finish as a spray paint but it is very resistant to oil, petrol and other solvents. At this stage the plan was to paint the car myself in cellulose which I have done before. I planned for the car not to have any bumpers so I removed the support rods from the engine bay when I renewed the cross member. I think the bumper-less view at the back is great bu there is a real issue around finishing the front wings and front panel properly. I tried these triangular pieces but have not gone with that so far. Our new house in Staffordshire only has a single garage at the house which makes working around the car difficult - especially as it is really half a double garage and so narrower than normal. I also have a woodworking lathe along one side and a work bench which take up room. So work has to be done outside if possible and it weather dependent. This year I decided I need to sort this project out - I did get the car in 2002 after all. It had to be done at home because even though we are fortunate to have another garage on another site it does not have any power. So here are pictures of the car stripped of paint - or almost and the beginning of filling the panels. I really hate the paint stripping job. There were lots of layers and nothing much except mule skinner discs shifted it. I don't think the neighbours enjoyed it much either! It took ages because I limited myself to one or two days a week for as short a time as possible. The car was ready for painting in February of this year. I went to the paint factors to get more brush on enamel in Trafalgar Blue to paint the inside of the boot lid and bonnet - just to cut down the spray painting. Anyway the paint they mixed up didn't look right so I asked them to add some more blue thinking that even if it wasn't exactly right it would not matter on inside panels. When I got home it was way off - but really nice and my wife preferred it. So we decided to go with the new blue which has no name. After a lot of thought I gave up the idea of spraying it myself. I couldn't really do it outside and the garage is very restrictive. So we searched around and found a classic car restoration company who did the job for us. The pics below are of the car arriving back home in April. Most of the neighbours came out to have a look. As you can see it looks very bright blue! In reality it is a bit darker than the photos suggest. Its taken me until last week to fit up the repainted shell. I have used a lot of new parts but also retained some of the old ones because they are part of the car's story. The bonnet badge and crest are old. I decided some time ago that there would be no side windows so the edge of the quarter lights and tops of the doors are finished in ash. The idea is to have an ash capping all round the body and add fittings for a tonneau cover but that will have to wait a while. I am reasonable happy with the panel fit. The doors and rear quarter panels have been repaired and the wings are pattern parts - so not always easy to fit together well. I have fitted inertia reel seatbelts to the front but static belts at the back. I thought that the rubbing of the belt with the inertia version would damage the rear seat cover. The seats are cleaned up old ones and not new. The door cards and other interior trim were made by me with my wife sewing up the piping. I am please with the result. We got the vinyl from a local fabric shop and put a light upholstery foam designed for car work between the vinyl and the board to give a bit of texture. As there is no window winder handle I did not want to buy door cards and then have to fill in a hole. This is the last bit of the rebuild story. I tried both types of boot lid seal but neither fitted properly. The curvature of the boot side and the lid meant that they would not compress enough in the middle to allow the lid to shut. So I fitted a simple rubber U shaped seal which seems to work OK.
Having painted the outside of the car in the new blue I was faced with a choice regarding the engine bay which I had previously painted in trafalgar blue. I didnt like it but I did not want to take the engine out. I took off ans many components as I could and then using some small brushes I carefully painted around the engine bay in the new colour using the brush on enamel. I think it is a lot better but it delayed the rebuild a bit. When doing the final fitting of the distributor I wanted to check that the drive was in the right place and so pulled it out of the engine using the tappet cover bolt as in the manual. I got it all lined up - then dropped it into the sump! So another delay to remove the sump and get it back. I know that it is lined up according to instructions but no1 spark lead is not in the expected place - never mind it works. The car went to a local garage this week to have the tracking set up and it was also a good chance to have an inspection underneath. One or two things need attention but nothing great. The guy at the garage grinned all the time and took photos. I hope you like the result. Its my wife's car really and she loves it. It needs a good run out and a bit of fettling but after 16 years she has the open top car she has always wanted. Though I have not posted much on the forum I have consulted other people's posts a lot over the years so I want to say thanks to everyone for all the advice they have shared and which I have picked up.